Joining Montgomery on stage will be Barry Goudreau, former lead guitarist for Boston and the Sax Attack Horn Band. Tickets for the event, which will be held from 5:30 p.m. to 9 p.m. are $30 in advance and $35 at the door and may be purchased on line at sosrco.org.org. In addition to Montgomery and company, this year’s concert will also feature the two well-known and popular bands August First, a Massachusetts based band that celebrates the many musical incarnations of Jerry Garcia and Erin Harpe and the Delta Swingers. Called one of the “most dynamic, talented and exciting roots rocking blues women on the scene” by Living Blues Magazine, Erin Harpe and her Boston Music Award winning band recently released their second album, Big Road. 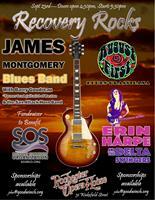 Prior to the Recovery Rocks Concert on September 23rd, SOS RCO will also be hosting a Recovery Rally from 11 a.m. to 3 p.m. at Henry Law Park. In addition to inspirational speakers, music and a variety of other activities and events, this family friendly event will also feature various exhibitors so that people can learn about the numerous recovery prevention, treatment and recovery support programs that are available in the community. “Sponsorship opportunities for both events are available. For more information about sponsorship opportunities, please contact Rene Philpott at rphilott@goodwin.org or 603-841-0996. Proceeds from the event will benefit SOS RCO. A program of Goodwin Community Health, the mission of SOS RCO is to reduce stigma and harm associated with substance misuse by providing safe space and peer based supports for people in all stages of recovery, For more information about the organization go to SOSRCO.org or call 603-841-2350.